Rebekka Löffler (Freiburg im Breisgau, 1985) grew up in the Black Forest region near Freiburg im Breisgau, Germany. She received her master’s degree at the Staatliche Akademie der Bildenden Künste Karlsruhe in 2012, and was a resident at the HISK (Higher Institute for Fine Arts) in Ghent, Belgium in 2016-2017. Rebekka Löffler’s paintings explore the interface between the explainable and intangible aspects of being. They demonstrate her reflection and response to the conditions and occurrences of life. Painful or rousing, subtle or sublime moments of life evoke the urgency to be shaped in all their states of matter and to be coloured in all shades in order to grasp and frame a cleared and decipherable image of life—an image that wants to question the representation of reality, and depict a multifaceted and fluid perception of life. The initial moment of creating a painting—the idea as a leading thought—leads to new thoughts and associations. Moreover, it evokes sensory perceptions, emotions, memories, and subliminal impressions connected to it. To use the initial moment as a point of departure allows the artist to probe the idea from different angles and to create a space for experience. The painting becomes like a body of sound in which different vibrations resonate at the same time. Her works explore themes that are connected to personal experiences such as language and identity (‘Parentsland – Children’s Language’, 2016; ‘Nests’, 2011), moments of realization and shifting perception (‘Giving Things a Face’, 2015; ‘Open Your Eyes and Look at Me!’, 2011), moments of movement and breakout (‘The Great Departure’, 2016; ‘The Scream / I do not see a hare’, 2012), the role of women (‘Courting a Bride’, 2014), the meaning and definition of land (‘Localized Words – Pensive Places’, 2018; ‘Green Table‘, 2010 ) and interpersonal interaction and relationships (‘You Are Colouring My Thoughts‘, 2018; ‘Entanglements’, 2017). 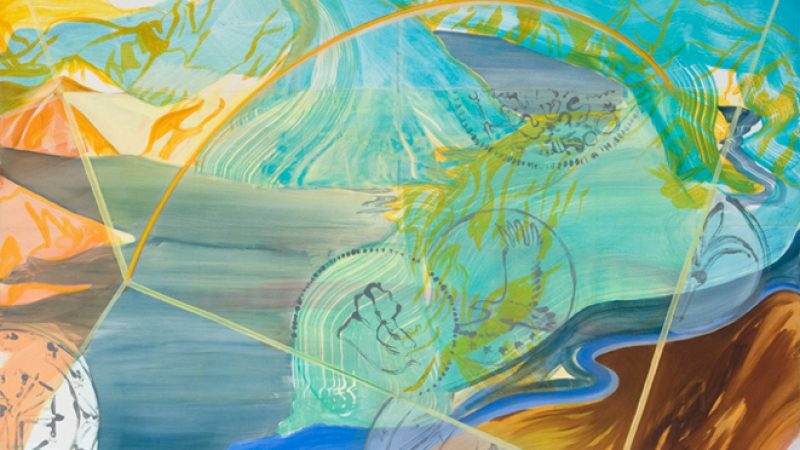 Her reflections on how to perceive a multi-layered and constantly changing world influences the formal aspects of her paintings. The artist is particularly interested in painterly means that influence the perception of the image, especially those which cause movement, rhythm, and a complex spatial arrangement in a painting. ln the painting ‘Entanglements’, 2017, for instance, there is a complex constellation of lines and shapes—round, organic, and angular—that collide, interact, and interlace. The pictorial space is not affected by gravity. Perspectives shift, switch, and fluctuate. Everything floats and moves with lightness in a state of uncertainty. The subject of the painterly investigation of ‘Entanglements`, 2017 is the interpersonal; the invisible web of sentiments spun between humans that catch up with us over and over again—one way or the other. In the last two years, Rebekka Löffler has started to combine her painting practice with writing, mostly poems and sculptural works in aluminium and clay. These different mediums exist in interdependence. A little three-dimensional paper sculpture becomes, for instance, a two-dimensional painting. A small drawing on paper is transformed into a contorted and distorted shape in space. The words of a poem form the shapes and colours of a painting. It is a working process that allows ideas to pass time and space and to manifest themselves in different forms and dimensions. The place the idea takes in space is always the same but its orientation in space is changing with the artistic tool that is trying to locate it. All the extensions in space breathe the same air of the initial moment and embrace the same following qualities: colour, form, size, dynamic, rhythm and movement, but the degree of their visibility depends on the perspective of the chosen medium. Her first solo exhibition Giving Things a Face took place at De Filatuur Gallery (Brussels, 2016) and was followed by a second one with the title ‘From you / to me. / From me to you.’ at Barbé Urbain gallery (Ghent, 2018). Recently she participated in group exhibitions like ‘As if we could scrape the color off the iris and still see’ at Twin Gallery curated by Sonia Fernández Pan (Madrid, 2018); Slippages at The White House Gallery (Leuven, Belgium, 2018); The Other Half, Three Painters at Magic Beans Gallery curated by Jurriaan Benschop (Berlin, 2018) and The Grid and The Cloud: How to Connect. at Vanderbourgt Building curated by Elena Sarokina (Brussels, 2017). She showed her works in institutions such as deSingel (Antwerp, 2018); Städtische Galerie Karlsruhe (2012); Städtische Galerie Stapflehus (Weil am Rhein, 2012) and Städtische Galerie Bremen (2008).